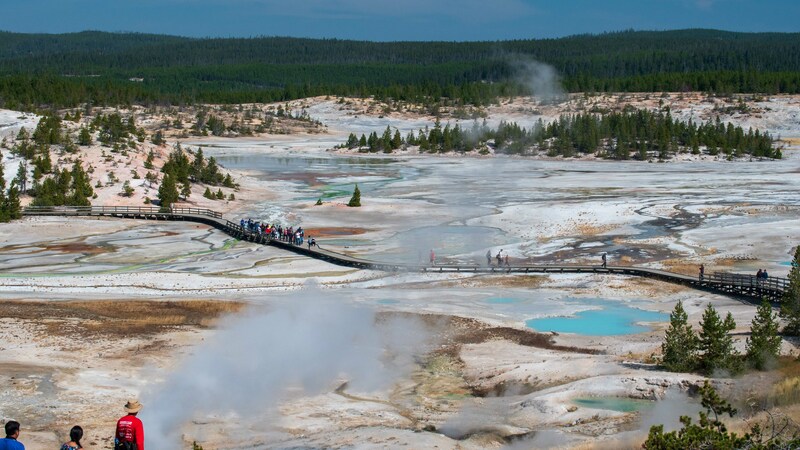 The sheer variety and quantity of geothermal features at Yellowstone National Park are unparalleled in the world. Norris Geyser Basin was the starting point for us on day 2. 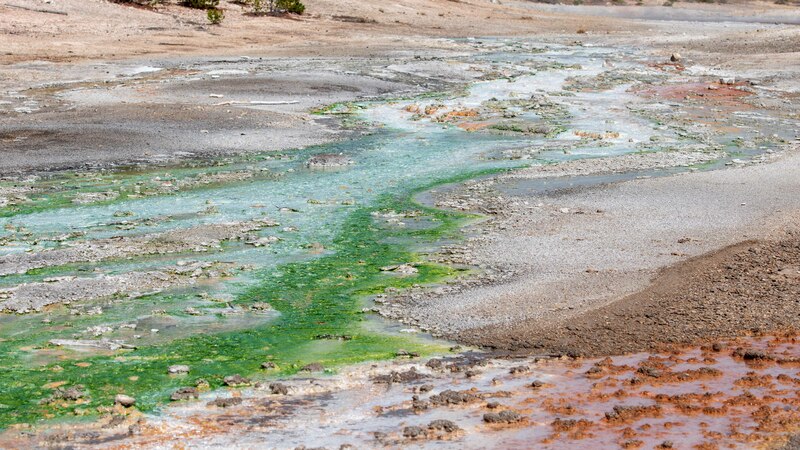 We came upon a strange landscape with steam rising out of the ground, ponds of clear blue-green water surrounded by white and red deposits created by single-cell life forms. There were two loops at Norris Geyser Basin. 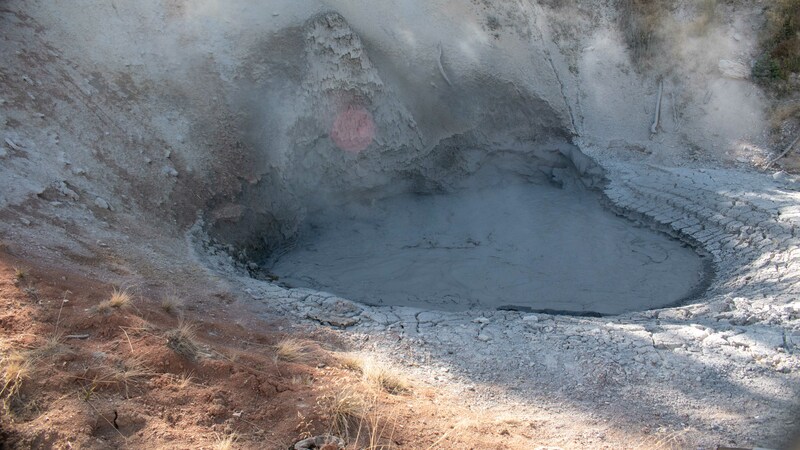 The shorter loop had a sampling of steam vents, clear ponds, and boiling mud and oh yes, tour bus crowd. The longer loop (still not very long), had more of the geothermal features, with a closer view, often right on top of the feature and oh yes, much less crowded because the tour buses do not allow enough time for the tourists to take the longer route. Day 2 was devoted to geothermal features of the park as we headed north after Norris Geyser Basin to Mammoth Hot Springs. Along the way on the Grand Loop Road, we stopped by an interesting picnic area – Sheepeater Cliff. It was a 40-foot cliff with jagged edges that was great for climbing as a family of 3 boys and a girl eagerly climbed the cliff and posed for pictures. This was probably the most fun for the kids for the whole trip! 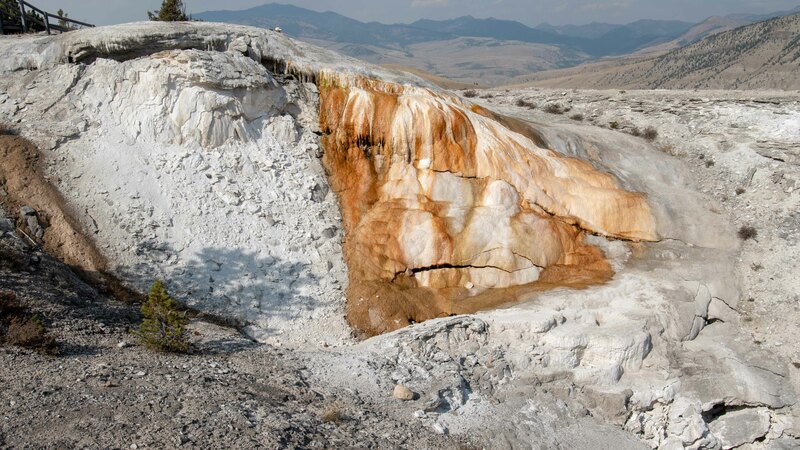 Mammoth Hot Springs had two parts, the upper terrace, and the lower terrace. The upper terrace was stunning with hot pools, cascading terraces of white and red rocks reflecting the afternoon sun. Hot water with rising steam flowed down cascading rocks. 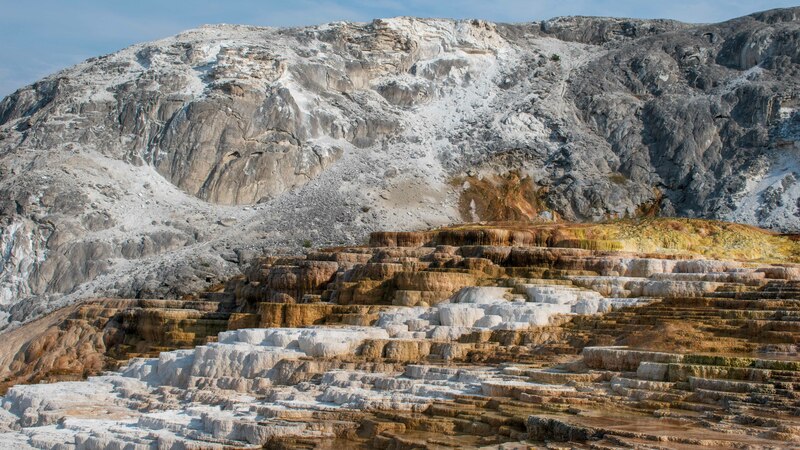 Carolina Terrance at the end of a boardwalk was the most stunning cascading terrace with hot steaming water flowing down white and yellow rocks terraces. Beautiful! The lower terrace was a nice walk around multiple thermal pools, vents, and cascades. 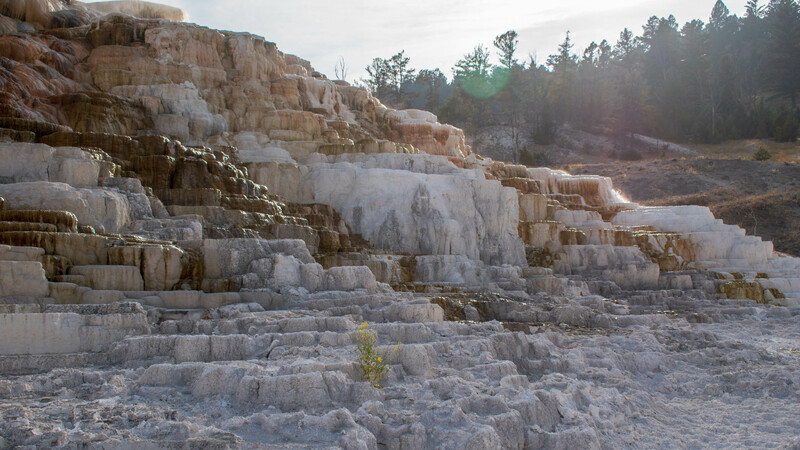 The rocks were white with yellow, green, and blue flows that trickled down the terraces. The various colors were single-cell organisms that adapted to live in the hot water and added so much beauty as the color contrasts against the white background. There was a connector trail between upper and lower terraces. Parking was limited on both sides so visit in the early morning or later afternoon. Cell service is very spotty at Yellowstone National Park. With AT&T, we had slow service at one spot in Canyon Village, and only voice service at Old Faithful. As we descended down to Mammoth Hot Springs, my phone started to beep and buzz as the accumulated messages popped onto the screen! We actually got cell service with decent speed! After a couple of days of almost no cell service, we lingered at Mammoth Hot Springs village, caught up on the messages, made phone calls back home to check on hurricane preparation (hurricane Florence was heading for our home in North Carolina), and downloaded the podcasts that will sustain us during the long drives! The last time we were in Yellowstone National Park in 2004, there was no cell service anywhere in the park. Somehow, I didn’t feel isolated. It was before the mobile internet became a “thing”. Now, it felt so isolating to not have cell service for even a few hours. How life and expectations have changed. On the way back to Canyon Village, as we drove through Dunraven Pass, Loretta spotted a black thing that was moving off of the side of the road. Before I can slow down, the black bear scampered up the hill. There was no place to pull over so we couldn’t stop and take a photo, but it counted as a bear sighting and a close one at that. As far as Loretta was concerned, that was the perfect way to view a bear – from the safety of the car with the bear moving away from us! I, on the other hand, really wanted to see a bear in the open, hopefully, less than 150 yards away. She got her wish and I’m still looking for my chance! I’ve been learning about photography and one of the principles is good light for landscape photography. On day 3, I somehow convinced Loretta to get up before sunrise so we can get the best light of the day – dawn – for photographing the Grand Canyon of Yellowstone, one of the most dramatic landscape features of Yellowstone National Park. During this early hour, we had the park to ourselves. 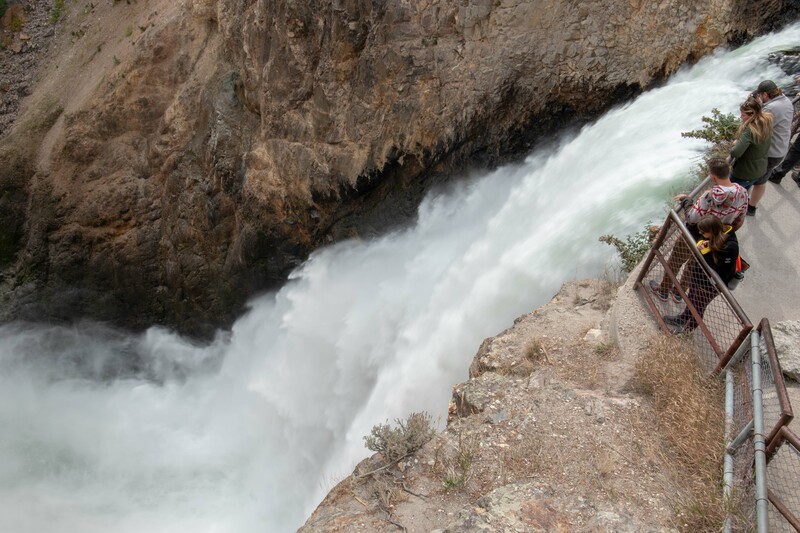 We drove along the North Rim in search of the best scenic spots for the sun to light up the Lower Fall of Yellowstone river. I had this beautiful time-lapse of the changing sunlight and color reflecting off of the canyon in mind but I forgot Mother Nature was still in charge – it was a CLOUDY day! No dramatic change in sunlight or the view of the waterfall! I did start the time-lapse on my little GoPro on a small tripod perched on a rock by the cliff but it was precarious. A strong gust of wind or an accidental knock would have been the end of the camera, forever polluting the Yellowstone River. My better judgment prevailed and I took it back after a few minutes. This time of the morning was magical at Yellowstone National Park! We were pretty much by ourselves at overlooks that would have people jostling for position in just a couple of hours We took as much time as we wanted to set up the shot, take the shot, and generally enjoy the spectacular scenery and the roaring waterfall. We hiked down to the bottom of Red Rock trail for another perspective of Lower Fall and only saw four other people on the trail. 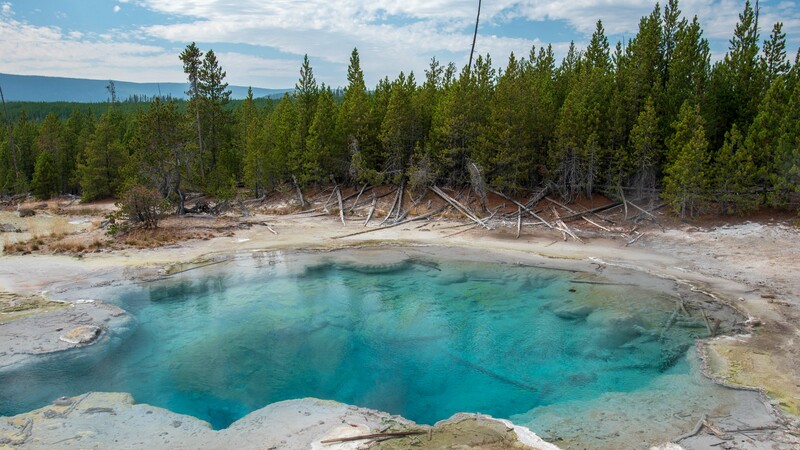 Yellowstone National Park without the crowd – what a treat! As the sun rose, we went to Artist Point on the south rim where most of the iconic pictures you see for Grand Canyon of Yellowstone were taken. By the time we got there, around 9 am, three tour buses were there already with hordes of tourists (theme park people) vying for pictures. The Chinese tour group, while loud, were respectful and took turns without too much jostling. One lady wearing a surgical mask climbed on top of the railing for a better picture as a dozen people yelled at her to get back down. She was nuts! A little slip and she would no longer be of this earth! I got my turn and took the requisite pictures, but we should have gone to Artist Point at sunrise. Even though people were polite, they were still loud as they gestured and talk loudly for best pose, all in their excitement of the absolutely gorgeous scenery. Their excitement was understandable but the sheer number of people and the noise made it hard to enjoy the stunning beauty. 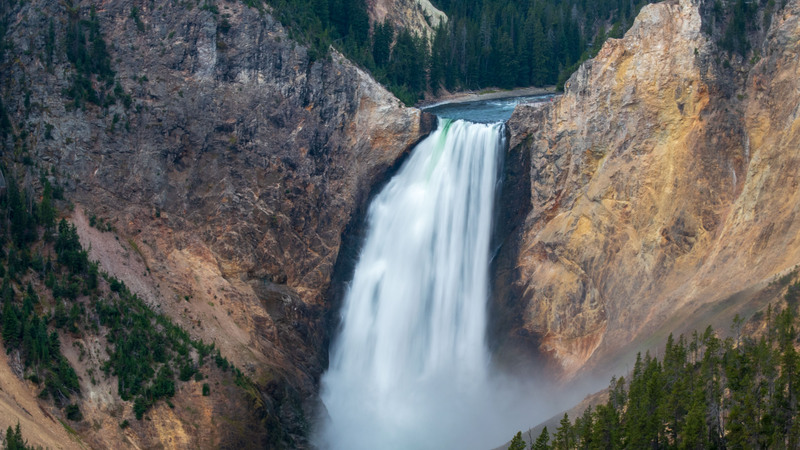 The Lower Fall of the Yellowstone River was the iconic scene and it was pure beauty when viewed from a distance at Artist Point. My eyes couldn’t help but follow the canyon to the waterfall as the focal point. A trail from the North Rim road led to the Brink of Lower Falls where we go up close and personal with the waterfall. I felt the sheer power of the river when I stood next to the brink of the waterfall where the peaceful river with a few ripples turned into a thunderous drop of 175 feet into a cloud of mist. While Lower Fall was the attention getter, the Upper Fall was also very pretty to view, especially from the Brink of Upper Fall viewpoint. I felt the power of the water flow and heard the loud roar of the water as it dropped into a mist. Get up early, not just for pictures! Getting up early was well worth it!! We had the park all to ourselves for the first 90 minutes after sunrise. As Yellowstone National Park woke up from the night to welcome another day, she stirred to life as the clouds got brighter and the sun pokes through the clouds from time to time. Wouldn’t you get up early for beautiful scenery, soft light that accentuate the landscape, and few people? Do it, you won’t regret it! After a bit of rest from the early morning start, and a good lunch at Canyon Village, Sulphur Calderon, and Mud Volcano, just south of the Grand Canyon of Yellowstone, were our next stops. Sulphur Caldron was several pools of muddy boiling water, full of energy and anger as if it was going to erupt and splatter mud in my face at any time. Mud Volcano had a loop of boardwalk with pools of muddy water, some thin and some very thick, and many steam vents. The thick muddy pool made the plop, plop sound, the thinner grey muddy water looked angry and made a boiling sound while the steam vents made a hissing noise as steam rose into the air. These sounds formed nature’s symphony as heat from the earth just below made its presence felt. One steam vent named Dragon’s Breath was surreal. It was a hole with steam venting from it in a rhythm pattern as if it was the nostrils of a beast inside, mad as hell and ready to come after us. Even the rock formation where the steam came out looked like a dragon’s head. Continuing down the Grand Loop, we headed for the Lake District and found this neat flat trail that also doubled as a bike path to Natural Bridge. Yellowstone National Park seems to have everything, even an arch. 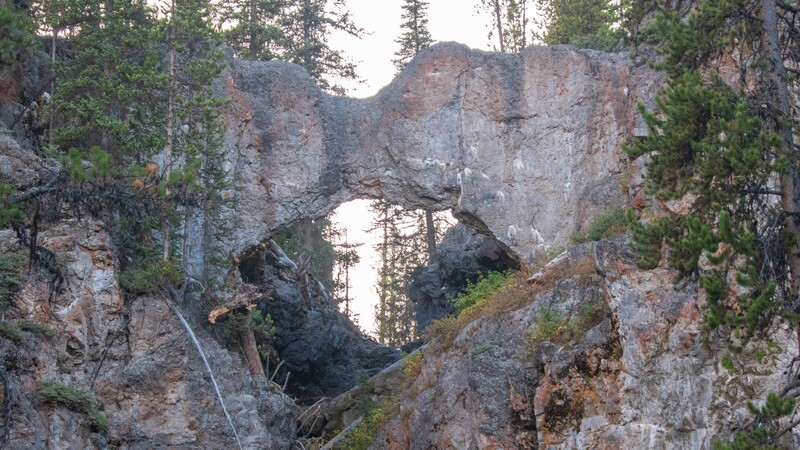 This was a natural bridge formed by erosion, reminiscent of features at Arches National Park. On the way back, there was a squirrel on a log making chirping sounds. His tail went up and then went down in rhythm with the chirp as if he was putting on a show for us! While Yellowstone National Park was very crowded in places, it’s easy to get away from the crowd. This trail was an excellent example. These were the “attractions” that require a bit of time, beyond the tour bus itinerary. 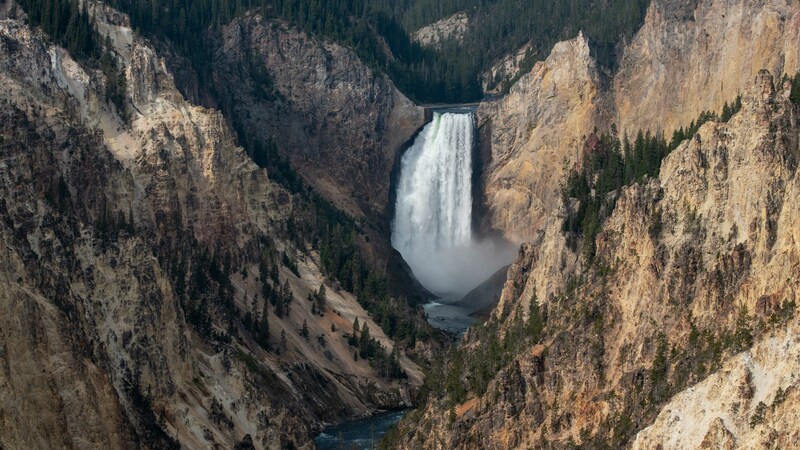 Yellowstone National Park is vast with so many interesting areas to visit it can spread the crowd out much easier than the constricted spaces of Yosemite Valley or Zion Canyon, where the crowd had nowhere to go. Certainly, the top attractions were crowded with bus after bus full of people but the hiking trails were still quiet and peaceful. 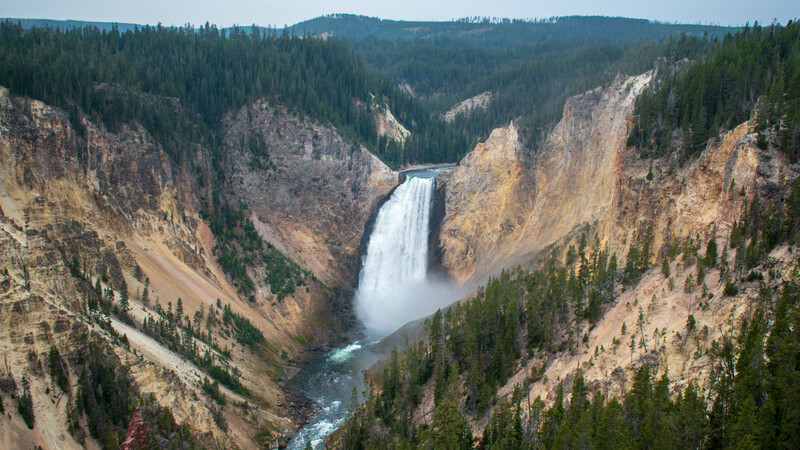 To really enjoy Yellowstone National Park, go hiking! 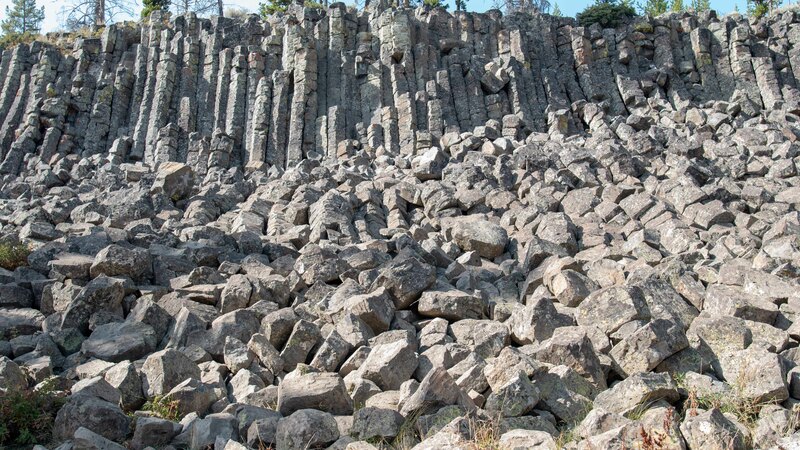 Those lava formations at Sheepeaters Cliff are very similar to the ones on Penghu Island. And I can’t believe they built a walkway across the bubbling springs of hot mud and steam; not to mention it is on top of the Caldera! 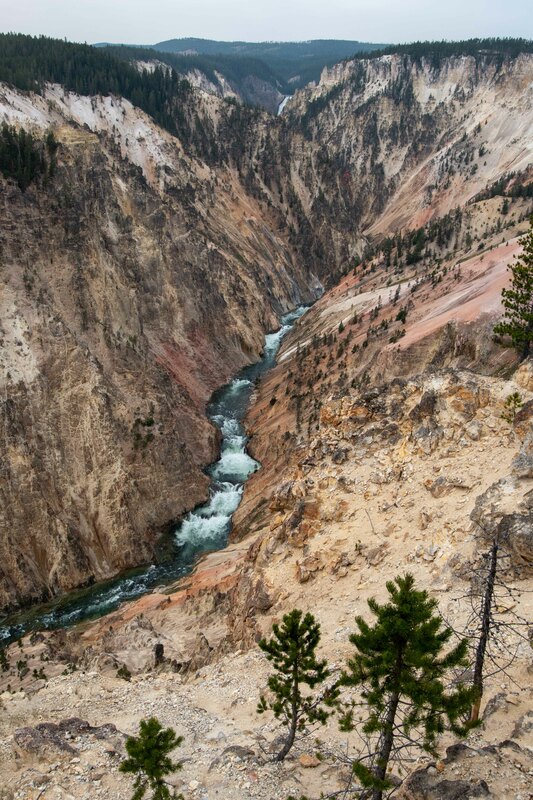 But when I think of Yellowstone, this is the image I have of the park. Luckily you’ve covered the rest so that now I have a better idea of how vast the park really is. Yep, the park is vast and has such variety! That’s why it’s my favorite.